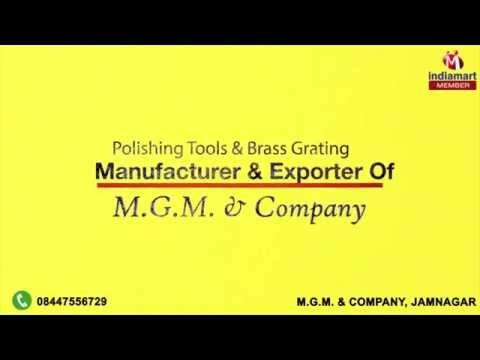 M. G. M. & Company is one of the leading manufacturers, suppliers and exporters of Diamond Polishing Tangs, Diamond Faceting Tangs, Diamond Faceting Dops, Door Viewers and Brass Gratings. These are highly durable, reliable and have long service life.The state-of-the-art infrastructure facility set up by us enables our astute professionals to bring forth a gamut that caters to the diverse requirements of the industries. Owing to our excellent financial status, we have ensured to inculcate an advanced total quality management unit and in-house designing unit along with the other units. Further, with the help of our technically advanced resources and the R & D experts, we are able to be in sync with the latest industry norms. Due to the above factors, we have been able to muster a huge client base in Indian Subcontinent, Singapore, Indian Subcontinent, Middle East, South America, South/West Europe and North America.